Sure, I cropped the frame a little too close to the top of my head; new technology can't change that, but you get the idea. Watch for more episodes this week and for the rest of the year. We're back in full swing and I just can't thank you all enough. The last of the incentives are being ordered and produced right now (t-shirts and calendars); they'll ship at the beginning of December. The chromatic method book is back on track now that I'm home for a spell, along with a number of other creative endeavors, including the duet book with Jeff Hames, and a number of new recordings. 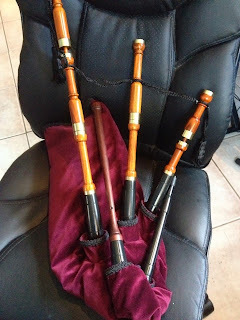 "To The Make Of A Piper…"
I'm self-taught on all the instruments that I play (except for clarinet, which took some years of instruction in middle and high school) and decided to pick up the bagpipes, which I've been told is something that you really shouldn't try to teach yourself. 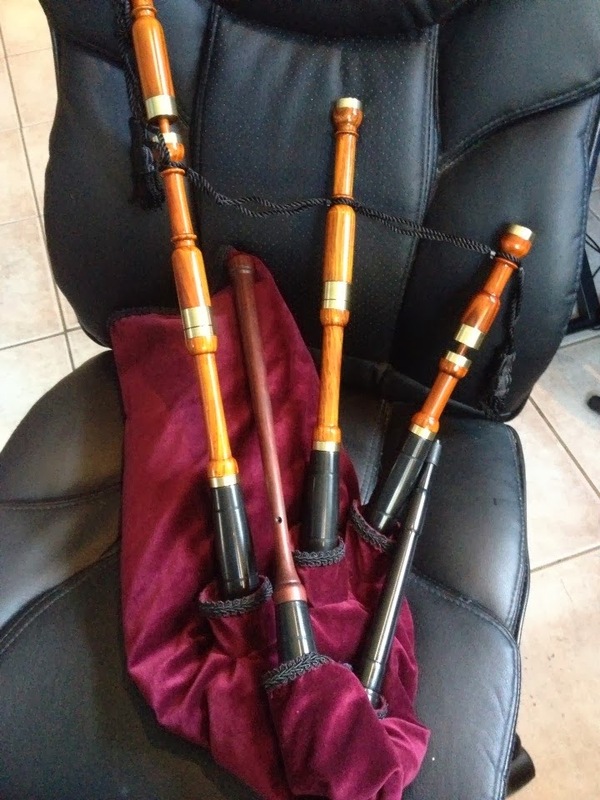 I love the sound of the bagpipes, but also wanted to start with something that wouldn't totally make my neighbors hate me and that wouldn't cost an arm and a leg for a beginner. I decided upon a set of Gibson Fireside Pipes which are lower in tone than the Great Highland Bagpipes and can be played indoors. • I love the sound of them and have always wanted to play them. • By playing another wind instrument (and a demanding one at that), I'm looking to bolster my abilities as a singer and player of other wind instruments, developing new techniques and increasing lung capacity that will help me across the board. • I wanted the discipline and routine of working on a weekly basis with an instructor who would not only give me direction but also challenge me continuously. I do pretty good as a self-starter, but I work best under someone's tutelage - not something that happens often in my career. • Adding another skill set to my repertoire just makes sense, especially with an instrument that is so in demand. That all said - it'll be years before I'm any good at the things, but I am still very excited about it and I've got my first lesson in a week with Reginald Lyle. Watch and listen for updates! Lots to do, so I'm off to do it. Thanks for your patience during the slow periods here on the blog. I'll be back with more mountain dulcimer sweetness soon!